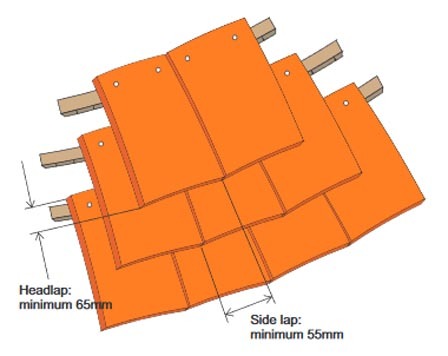 The battens should be scarfed at the back to enable them to be bent around the curvature of the roof. Refer to Special Features Techniques for more info on shaping battens. Each course is a different width and this will require the tiles to be tapered to maintain the bond or sidelap. 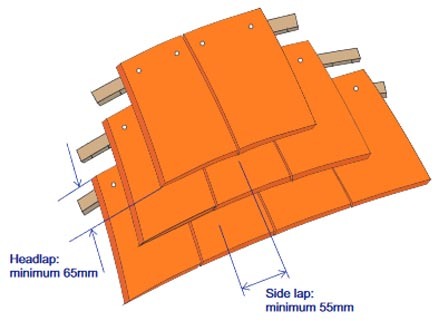 For example a typical conical roof of 70 degree pitch may require 3 sizes of tapered tile, the first of 150mm width at the tail, the second of 125mm and the third of 100mm. To maintain an effective bond, or side lap with the adjacent course, the minimum possible width of tile is 81mm. It may be necessary to redrill appropriate nail holes onsite for fixing. Depending on the radius of the curve, it may not be possible to reply on the nibs for support, therefore each tile should be nailed twice. Each course is a different width and this will require the tiles to be tapered to maintain the bond or sidelap. To maintain an effective bond or sidelap with the adjacent courses, the minimum possible width of tile is 81mm. It may be necessary to redrill appropriate nail holes onsite for fixing. Depending on the radius of the curve, it may not be possible to reply on the nibs for support, therefore each tile should be nailed twice.